Mary Jane Lamond & Wendy MacIsacc played indoiors at a Canadian showcase bash in London on Monday – a quiet, still confidence. A Suffolk’n’Cool week of great highs and lows so far – a brilliant afternoon of Canadian music in London on Monday. The new Suffolk’n’Cool site went up yesterday and today an innocent update to a theme brought it crashing down again – and it’s only Wednesday. Never mind. We’ve some really interesting music this week from the likes of Paper Beat Scissors, Pigeon Park, DubRaJah, Abandoned Pools, Mary Jane Lamond and Wendy MacIsaac, Bereto and 7Horse. 7Horse is what happens when you dump accelerant on the smoldering embers of creativity. The fresh avenue for rock veterans Joie Calio and Phil Leavitt, 7Horse’s music burns where cosmic country meets dirty blues, where primal urges unfold into bawdy nights, and where two friends — and longtime bandmates — discover radically new sides of each other. Calio and Leavitt were stuck in a seemingly interminable holding pattern with their longstanding project dada, the trio responsible for the hits “Dizz Knee Land” and “All I Am” but whose efforts to make a sixth studio album had stalled. The notion of creating something new and sonically different took hold. The pair began trading ideas via iPhone, sometimes as little as just a riff and a phrase. “I’d get a sound file with a killer riff on it and the words ‘Meth Lab Zoso Sticker,’” Leavitt says of one exchange that would become a 7Horse song title. Convening at the Woodland Hills, Calif., studio of Scott Gordon and using time originally booked for dada, the two began taking their song sketches and filling them in. The sparks that flew during the making of “Let the 7Horse Run” are reflected in the feeling of immediacy on the album. “Let the 7Horse Run” recalls a long lineage of blues music from Robert Johnson and Son House to Keith Richards, Led Zeppelin and early ZZ Top and even to contemporary purveyors like the Black Keys. Pigeon Park was formed four years ago by founding members Nick Weber (Vocals) Kevin Okabe (Guitars) Logan Pacholok (Guitars and Vocals) Artur Leppert (Bass) and Hunter Elliott (Drums). Together the five of them began a musical journey embarking on two cross country tours and recording two albums. The band released their debut record “The Sun” in 2010. 2012 saw the band touring nationally, playing popular BC festivals and being chosen as a finalist for 99.3 FOX seeds, expanding their fan base across Canada. Upon returning from tour, they stepped into the studio and released their new self titled EP August 31st. DubRaJah is a project of Sergey Gabbasov. He is a social anthropologist, specialising in the peoples of the Himalayan region, director of several ethnographic films about different cultures of Asia and Africa, traveller, musician. Sergey collaborates with such artists as Eric Mouquet (“Deep Forest”) and Robert Rich. The album Terai is a dub dedication to authentic cultures of Southeast Asia. Abandoned Pools release their long-awaited third album, Sublime Currencyon August 28, 2012 via Tooth & Nail Records. Sublime Currency is the culmination of the eleven-year journey of Tommy Walter, the songwriter and musician who was bassist and co-founder of the critically acclaimed band eels, who sold well over a million copies of the debut album, Beautiful Freak. Sublime Currency is the follow up to Abandoned Pools’ 2005 releaseArmed to the Teeth, a disc that revealed a songwriter grappling with confusion and darkness. Now less confused and less dark. Probably deluded, but certainly less dark. Bareto was born in 2003 as an instrumental group. From Bareto’s latest (2012) LP: Ves lo que quieres ver (in english: “you see just what you want to see”. Ten songs written by the group, in their first time working with a music producer (Miami based Manuel Garrido-Lecca), mixing cumbia, reggae, psychedelia and dub, among other latin generes. The lyrics talk about how Peruvians have to deal with their differences as society (in Perú, every city is like a little country) to keep the machine going. The first single off the album is called “Camaleon” (“Cameleon”), a song about how politicians change every time because of their personal convenience, no matter what’s better for their community. In the music video, a clown try a “politician costume” and go for the election poll. Other subjects in the record are racism, social differences and street insecurity, facts that coexists in Peru’s everyday reality, but that are not easy to talk about, because, as the title of the album suggest, “you see just what you want to see”. The Argentinian singer and composer Kevin Johansen is the special guest in the album, singing in this track “Matagalán”. On Cape Breton Island, Nova Scotia, the rich heritage of the region’s settlers from the Scottish Highlands is kept very much alive through music, songs and stories. Seinn is a new release from long time friends Mary Jane Lamond and Wendy MacIsaac, two stalwarts of the traditional music scene in Cape Breton. 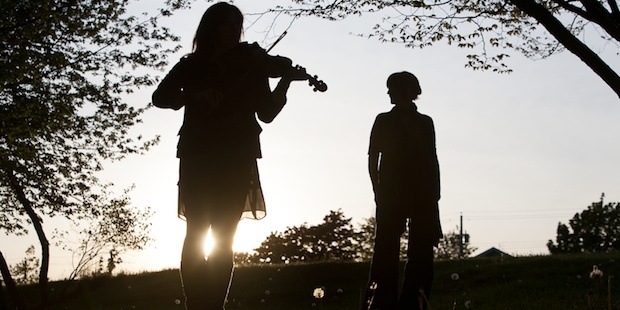 While their friendship and a shared interest in Nova Scotia’s Gaelic heritage go back a long way and they’ve played together before, this is their first formal collaboration. Wendy is an award-winning fiddler, piano player and step dancer from Creignish, Cape Breton. While visiting her grandparents throughout her youth, Mary Jane fell in love with Scottish Gaelic traditions and song and released her first album while enrolled in Saint Francis Xavier University’s Celtic Studies program. Relocated Burnley boy Tim Crabtree began Paper Beat Scissors in 2008 following a move to Halifax, Nova Scotia eight years ago. I met Tim at the Atlantic Canadian Music Industry Association showcase event in London on Monday. His performance was remarkable and totally mesmerising. Really subtle and intelligent use of loop machine gave his work an etherial quality which was compounded by his haunting, passionate falsetto notes and delicate guitar style. It must be difficult to get up and perform to an world weary music business audience, knowing that you only have 20 minutes to impress – but for me Paper Beat Scissors has it. His eponymous album is a remarkable piece of work.